Maps are for general use only. Conditions on the forest's unimproved trails change constantly. Mountain bikers, use trail maps only as a guide for what to expect. You bear the responsibility for knowing your abilities. 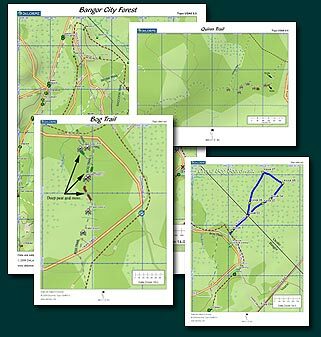 All maps are in PDF format and require the free Adobe Reader. Maps generated using Garmin Rino 120 GPS with WAAS enabled and DeLorme Topo USA 6.0.